For 2018, Easy Motion is expanding their already large lineup of electric bicycles for North America and offering some motor updates. 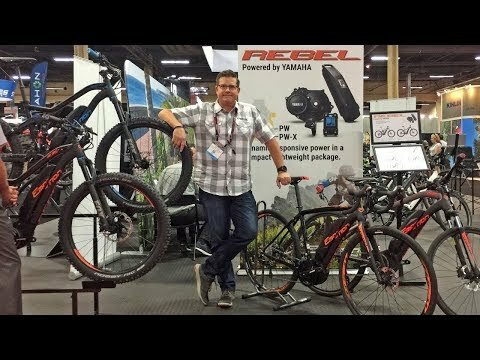 I spoke with Greg Ford, the National Sales Manager, while attending Interbike to get all of the details about new Easy Motion Products. The first ebike we saw was their AWD Big Bud electric fat bike. We looked at the Evo Eco which is priced at $1,999 and is small and approachable for urban or city riding. This one has a 500 watt hour battery and 500 watt motor and now an adjustable stem and thru-axle with easier rear-end quick release. This and other Evo models still use the TMM4 torque sensor for pedal assist and some offer twist throttle operation as well. Easy Motion has been in operation since 1909 and offers one of the best warranties in the electric bicycle space, five years on everything but the battery which gets two years. Next we looked at the Evo Nitro City which is a 28 mph speed pedelec that also has a throttle for $3,499. The Evo Street now has a 600 watt hour battery pack (along with most of the other Evo models). Easy Motion has a Pro display which is larger and center mounted and has a USB A charging port at the base, but they can also still be used with the traditional side-mount display which I thought was cool. The Evo Cross got cheaper, dropping to $2,799 and also got smaller 26” wheels for a more nimble ride feel. After catching up with the existing line of e-bikes, we moved on to the Rebel platform which is totally new for 2018. These models work with the Yamaha PW and PWX mid-drive motor systems. The Rebel Cross starts at $2,799 and comes in three sizes. This one does not have a throttle like the EVO Cross but is more efficient and probably better at climbing. Next, we looked at the Rebel Gravel which has drop bars like a road bike but trail-ready tires and a longer frame to handle gravel grinder type of riding. It has rear rack and fork bosses so you can load it up for bikepacking or commuting. I was impressed by the 12 mm axles front and rear on this particular model. Greg told me that this model uses the Yamaha PW motor and weighs in the low 40 lb range. It uses a smaller 400 watt hour battery and is priced at $3,399. Next, we looked at the Rebel 27.5” and 29” hardtail mountain models which also use the PW motor and cost $2,999. They come in medium or large frame sizes. The highest end is the Lynx 5.5 model which is a full suspension at $3,799. It uses a split pivot rear suspension with 120 mm travel front and rear that Greg was excited about. It also has Shimano hydraulic disc brakes with ice tech rotors. This one also uses 27.5” wheels and comes in medium and large frame size. A bit later, we moved on to the PWX Yamaha powered models which offer higher torque output and a wider cadence support, up to 120 RPM. The Rebel 27.5”+ with 2.8” plus sized tires, a Shimano Deore XT drivetrain with 11 sprockets in the rear 11-42 and two sprockets up front. It comes in small, medium, and large frame sizes and is priced at $3,999. For $1k more, you can get the Lunx 5.5+ model with full suspension and the same Yamaha PWX motor. I was able to test ride the new Yamaha motor and inserted some footage from the e-bike test track around 17:29 in the video. Atom is the final line of electric bikes we looked at, it started with the hardtail 27.5 cross country mountain bike in small, medium, and large with the standard Brose motor priced at $3,399. Apparently the Brose S motor offers a more continuous 90 Nm of torque vs. a peak rating. It’s also supposed to have less drag and more of a free feel when pedaling. Atom Lynx 6 now comes with a dropper seat post, priced at $4,599. Apparently there’s a new Easy Motion Premium App using Bluetooth for the bikes as well as some adjustability with the Brose display readouts, and they also show colors so you can get a quicker sense for what power level has been selected. The Atom X display has a full Aluminum bezel and a 256 mb processor. It can also connect to Ant+ for heart rate monitors but it does not appear to be removable, though there is a Micro USB charging port! The ATOM X is new high-tech model with excellent weight distribution, uses a 720 watt hour battery that slides into the downtube, haptic and tactile feedback with the button pad. There’s even a wristband that can activate the bike. They should be available in the USA in January / February of 2018. The Atom X costs $5,799 which is definitely at the higher end of the price spectrum. The hardtail version is $4,799. Easy motion is the 5th largest bicycle producer in the world and is based in Spain. It’s their 6th year in the US (starting in 2011 / 2012 here).